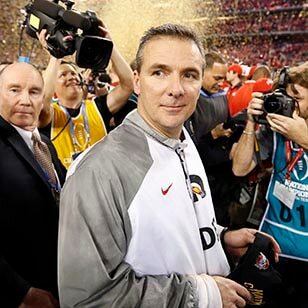 The Buckeyes' win brought coach Urban Meyer his third career national championship -- his first at Ohio State. ARLINGTON, Texas -- Ohio State can add the newest version of the national championship trophy to a case that already has a bunch of the old ones. The Buckeyes' third-stringer matched Oregon's Heisman winner as Cardale Jones led Ohio State past Marcus Mariota and the Ducks 42-20 in the first College Football Playoff national championship game Monday night. They didn't belong. They snuck into the playoff. They were playing with a third-string quarterback and they were going against everyone's hero. Isn't that just how you always pictured college football's first true national champion? Behind their bullish backup quarterback and the relentless running of Ezekiel Elliott, the Buckeyes (14-1) completed a remarkable in-season turnaround with a dominating performance against the Ducks (13-2). "The chase is complete," Ohio State coach Urban Meyer said. "It's done. It's over. They accepted their final mission, their final assignment and their final directive, and they did it. That was our whole mantra this last couple of weeks. A job well done, and we're very grateful." Ohio State began the first major college football playoff as the fourth and final seed, and as a team that faced questions about whether it belonged at all. It was a team that never would have had a chance to win a title under the old postseason system. No question about it now: Ohio State is the truest champion big-time football has ever crowned, showered by golden confetti as its band played "Hang on Sloopy" when the clock hit 0:00. Meyer's Buckeyes overcame two injured Heisman contenders and one awful early season loss at home to Virginia Tech to win their first national title since 2002. Back then, the Bowl Championship Series decided the top team at the end of the season -- usually. Before that, it was up to The Associated Press and coaches' polls to sort out which team was best, with a little help from the bowls. The Buckeyes have three of those championships, too. And Meyer now has three, adding this one for his home state team to the two he won for Florida. It's taken just three seasons in Columbus for Meyer to put the Buckeyes -- and the Big Ten -- back on top, with a team that looks built to last. Elliott, a sophomore, ran for 246 yards and four touchdowns on 36 carries. In the past three games against Wisconsin, Alabama and Oregon, Elliott had 696 yards rushing. "It was our dream. It came true," Elliott said. "With all the stuff we went through to get here, it's just crazy. It doesn't feel real." The Ducks went the Arlington and things were -- different. They brought the high-tempo offense with them, but it didn't work. Oregon was lucky to scrape together 20 points -- weird for a team that averaged 45.4 per game this season. Jones, who took over three games ago for the injured J.T. Barrett (who had taken over at the start of the season for the injured Braxton Miller), passed for 242 yards and a touchdown and ran for score. Jones, a 250-pound third-year sophomore, proved he could keep up with Mariota -- at least on this night. Mariota passed for 333 yards and two touchdowns, but the Ducks' warp-speed spread offense missed too many red-zone opportunities and couldn't unleash its running game against linebacker Darron Lee and an Ohio State front seven stacked with future NFL draft picks. Even with the benefit of four Ohio State turnovers, the Ducks were held to their lowest point total of the season, four touchdowns below their average coming in. Oregon has done just about everything as it has blossomed into a national power during the past two decades, but it will likely continue the search for its first national championship without Mariota. Barring a major surprise, Mariota, a junior, is likely to turn pro -- though he wouldn't talk about his upcoming draft decision Monday night. Elliott scored the game's last three touchdowns, finishing off the rout with a 1-yarder with 28 seconds left. While Elliott slipped and darted through the Ducks, Jones pushed them around and shook them off. When Jones surged and spun his way into the end zone with 4:49 left in the second quarter, it was 21-7 Ohio State and the O! H! I! O! chant made the dome in North Texas sound like the horseshoe in Columbus. The Ducks were facing their largest deficit of the season. If there was any concern that fans wouldn't travel to the championship game in the new postseason system, the packed house at the home of the Dallas Cowboys, awash in Buckeyes' scarlet and Ducks' yellow, put that to rest. The crowd of 85,689 was as charged as any BCS national championship game. The Ducks' fans awoke early in the third quarter. Ohio State was driving on the first possession of the second half toward more points when Jones' pass bounced off Jalin Marshall's chest and into the arms of Danny Mattingly for Ohio State's third turnover. Unlike the first two Oregon takeaways, the Ducks turned this one into points in a hurry. Mariota hit Byron Marshall on a slant and he streaked 70 yards for a touchdown, barely breaking the goal line before nonchalantly dropping the ball. Moments later, another Ohio State turnover. Jones looked a little bit like Florida State's Jameis Winston in the Rose Bowl as the ball just slipped from his hands trying to throw under pressure. Oregon recovered in deep in Ohio State deep territory. The Buckeyes held and this time the Ducks sent Aidan Schneider out to kick a 23-yard field goal to make it 21-20. In the first half Oregon, which goes on fourth down -- especially near the goal line -- more than most teams, passed on the field-goal attempt on fourth-and-goal from the 3 and Thomas Tyner was stopped a yard short of the goal line. Suddenly, an extra three points looked as if it could come in handy for the Ducks. But by the time Elliott went in from 2 yards out with 9:44 left in the fourth to make it 35-20, it was moot. The rest of the night turned into a Buckeyes Bash.